You’ve spent the last few months planning, planting, mulching and fertilizing your perennial garden, and now you can see the beauty of your work. July is the most colorful month of the year and, with just a few hours of summer perennial garden maintenance each week you can sit back and enjoy the showcase of color all summer long. July is also the month that weeds can overtake quickly so don’t lose sight of nurturing your garden each and every week. Taking care of it regularly will keep your garden looking lush and colorful for months to come. Watering – To keep your garden looking healthy, you must set a watering schedule. Even though watering by hand seems like a relaxing way to enjoy your garden, it is hard to stand still in one place long enough to give it the deep drink it requires every week. You are better off setting up a sprinkler or installing drip irrigation to run for a period of time. Keep an eye on the sky and measure rainfall amounts. Let the soil dry out slightly between watering’s and water it at least one inch every week. If heat and drought are prolonged, you may need to water much more frequently. Plants in full sun may require more watering than those in part sun. The best time to water is first thing in the morning or in the evening. Try to stay away from 10 AM – 6 PM when the sun and wind will evaporate the water quickly. Mulching – When the heat of the day stresses your garden, the best thing you can do is provide it with plenty of mulch.The mulch will conserve the moisture and will keep weeds from choking out your plants. Mulching also prevents erosion caused by summer thundershowers and storms. Bare soil will often get a hard crust on it that will not allow water or nutrients to penetrate easily.For mid-summer mulching, just add mulch where it has become thin. Try not to pack mulch up against the trunk of a shrub or tree. Mulch comes in many forms from bark, compost, straw, pine needles or even last autumn’s leaves, but they all serve the same purpose which is to hold in moisture and choke out weeds. Deadheading – To keep your garden looking fresh and to encourage new growth, deadhead any spent flower heads and cut back any plants that have finished blooming.Horticulturist Tracy DiSabato-Aust, author of The Well-Tended Perennial Garden: Planting and Pruning Techniques, suggests the following guideline for most perennials: “Deadhead when the seedpods outnumber the flowers or when the flower spike is about 70 percent finished with flowering.” When flowers are pollinated they form seeds which cost plants a lot of energy. If you prevent seed formation, you can direct energy toward other goals: producing new flowers and more leaf and root growth, all of which can help the plant look even better next year. Weed Control – To prevent your perennial garden from being overtaken by weeds you must weed before they go to seed. Mother Nature looks for bare soil and your best defense is to mulch heavily in the spring and spot mulch lightly in mid-summer. Use 2 – 3 inches of mulch to control weeds all summer long. Placing a thick layer of newspaper on the ground around your plants before adding mulch on top is an environmentally friendly way to control weeds. How to spot a weed? Weeds are known to have a weedy smell. Break off a piece of stem and smell You usually can tell by its smell if it’s a weed or plant. The longer you garden, the easier it gets to distinguish the weed from the plants. Fertilize – To encourage blooming and to keep foliage lush and green, fertilize on a regular basis. Using a fertilizer with a high middle number will insure your garden stays healthy all summer long. There are several products available for annuals and perennials including slow release fertilizers that can be used less often. Fertilome Premium Bedding Plant Food 7-22-8 is a slow release granular product that should be applied every 30 days during the growing season. If you have plants with powdery mildew or black spot fungus, spray a fungicide early in the morning or early in the evening, when the temperatures are cooler. You may notice that some of your plants need rejuvenating later in the summer. They may turn brown and look stressed from the summer heat. If this happens, cut them back and water regularly to encourage new growth. This is the time of the year to enjoy the fruits of your labor, so don’t let the summer take over your garden. 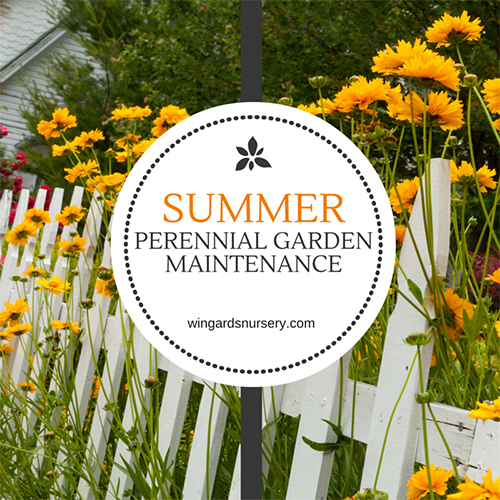 Follow these few easy steps to care for your perennial garden and keep it beautiful and productive all summer long. When you are creating your perennial garden, visit the nursery each month from April to October to see what’s blooming. Make selections at different times so that you will have bursts of color in your garden throughout the warm season. Also, make sure you include one or two plants that will bloom continuously. And, last, but not least, intermingle a few beautiful annuals for additional pops of color! For more information on adding perennials to your garden check out our Annual & Perennial Fact Sheet here.